We are a Sydney-based family of four with two boys aged 11 & 9. We have embarked on a trip (of a life-time for us) to travel almost right around the large continent of Australia (about 80% when done) on a journey of self discovery and teaching our wonderful boys about life experiences outside of a major city and what the outback and bush life is all about. We will be home-schooling our boys along the way and I have taken a year’s sabbatical granted to me from my place of work. As a family unit, we aim to visit and experience some iconic Australian outback places we have only ever read about. 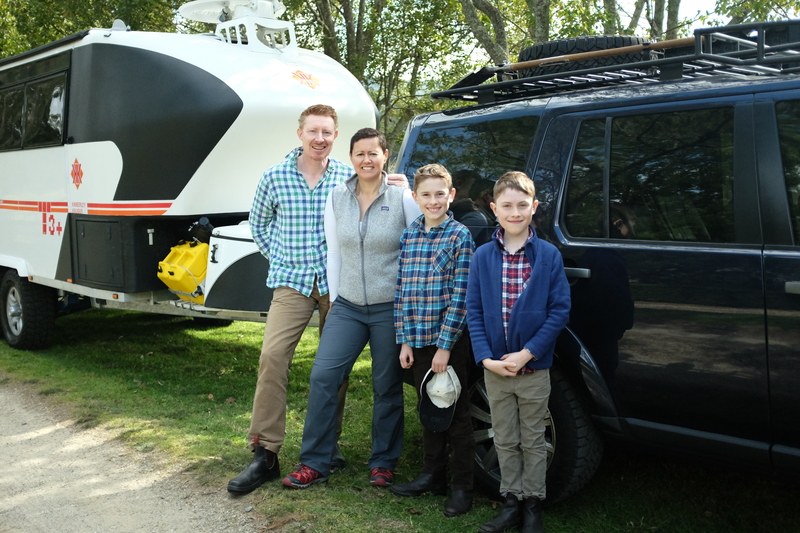 To experience our new mobile way of life, we will be living for the next year out of an off-road caravan – a caravan made by Kimberley, a 2015 Kimberley Kruiser T3. The guys at Active 4×4 in Newcastle did a great job getting us into the Kimberley and on our way. Our tow vehicle for the journey is our existing and much loved 2014 Land Rover Discovery 4 (V6, Twin Turbo) heavily modified with all manner of 4WD goodies to suit the job of rough roads, bogs, sand, rescue, navigation, carrying extra stuff and of course, suitably towing a 3.4 tonne off-road caravan on outback roads, desert tracks and highways. The guys at Active 4×4 in Beresford, Newcastle did a great job getting us into the Kimberley and on our way. 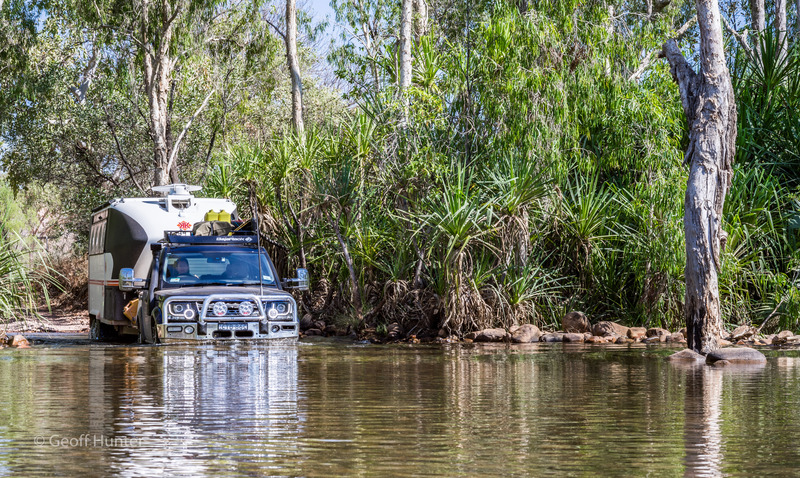 Our 2015 Kimberley Kruiser T3 and 2014 Land Rover Series 4 (known as Darcy or simply as ‘D4’) Crossing the upper Pentecost River, Kimberley Ranges, WA – October 2015. We set off on our journey from New South Wales on the 9th August in our new Kimberley Kruiser safely anchored to our trusty D4. Looking more like a space shuttle under tow, we headed north west towards Dubbo, then veered west for Broken Hill a few days later …the dual axle air suspension van floated behind us like a dream. In a nutshell, our basic trip route will take us to Broken Hill NSW, the Flinders Ranges in SA and surrounds, setting a course northward through the central interior of SA and upward to the Northern Territory, north west onto WA’s Kimberley region, across to Broome via the Bungle Bungle Ranges, zig zagging down the WA west coast including Karijini National park …all the way down to Albany in the deep south via Margaret River and other notable places and landmarks. From the great southern region, we’ll be heading up to Hyden, Kalgoorlie, direct east across the Nulabour to Streaky Bay SA, round Adelaide to Kangaroo Island, Mt Gambier, the Great Ocean Road, up through the Grampians, back to Broken Hill and across to do the Birdsville Track in SA. From here we will do a couple more explorer tracks before making our way across to SE Queensland before the journey back down the NSW coast to Sydney. Approx 35,000Kms in all is what we expect during this timeframe – unless of course we decide to extend our trip??? And to capture the essence of our trip, we’ll also blog our experiences of places, towns, national parks and sites we visit with insights, perspectives, ramblings, interesting photo’s and anything else we feel worthy of a mention. Most importantly though, we hope to learn from one another, continue to grow as a family unit, and hopefully emerge as better parents/people with stronger and more worldly boys in the process. Stunning family photo of day one Lift Off! Watch out ‘throny devils’ here come the Hunters!